Typically when one thinks of sunglasses, one automatically thinks of summer. Now that it's almost fall, sunglasses might not be a priority to some in the "accessories department", but to me they are always on my mind. As I have said repeatedly, Los Angles is the land of a perpetual summer, so I am always in need of sunglasses be it summer, fall, winter or spring. Last year I purchased these purple Prada sunglasses for a little pop of color and a deviation from your standard black and brown frames. While I don't wear them often, they are among one of my favorite pairs because purple is my favorite color. The thing with sunglasses is that they can be quite addictive, not unlike shoes. 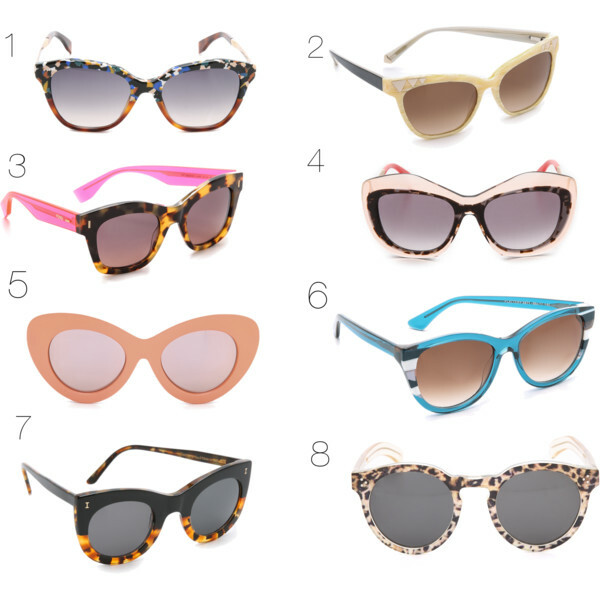 Okay, let's be frank: sunglasses, shoes, handbags, you name it, are all addictive in my book! In regard to sunglasses, I tend to get an urge about two to three times a year to acquire a new pair. Usually the styles change or a new brand comes in vogue, or I just get the itch for a change of pace. For me, sunglasses are something I wear on a daily basis, so wearing the same pair every day can seem boring and it's always fun to switch things up a little. Below are some of my favorite sunglasses for fall and beyond. I am just going to be honest: there is a pretty strong chance that I am going to cave and purchase the first pair from Fendi at some point in the upcoming months. I love the modern take on your classic tortoise shell sunglasses and the mutli-colored marbled effect. In regard to my outfit, even though it's almost fall, that doesn't mean I'm going to put away bright colors either. This is one of the reasons I love this new skirt from the J. Crew Factory. It has bright colors and a fun floral print, but the dark navy background makes it a perfect piece to transition in from summer to fall. Great choices of sunglasses! You look amazing! Love the skirt! I adore this outfit, head to toe! 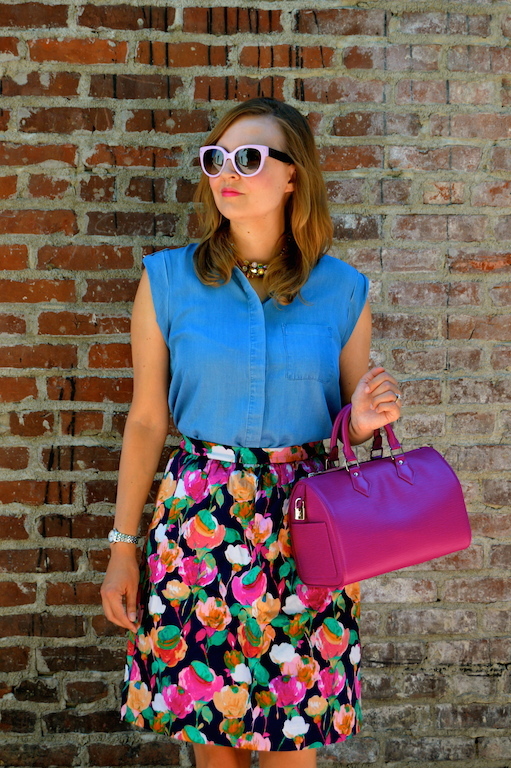 The chambray top and floral skirt are gorgeous together. Love the fun sunglasses too! I agree sunglasses are definitely a year round accessory! Love these! Good to meet you via Catherine's link up! Love the stripes and floral! You look so great. in love with this skirt -- i've been thinking about getting it myself too! love all the sunglasses you picked! Love the sunglasses with your look! Really cute! And the skirt and top pairing is fabulous! Love the sunglasses you're wearing plus the rest of your outfit is stunning on you. Your skirt is such fun and i love your stripe shoes. You look great. I can't take my eyes off of that skirt! Love how you styled it. And yes, sunglasses are a must for me in every season. Great picks. Love the Prada speedy!! You look fabulous and I love the pattern mixing! 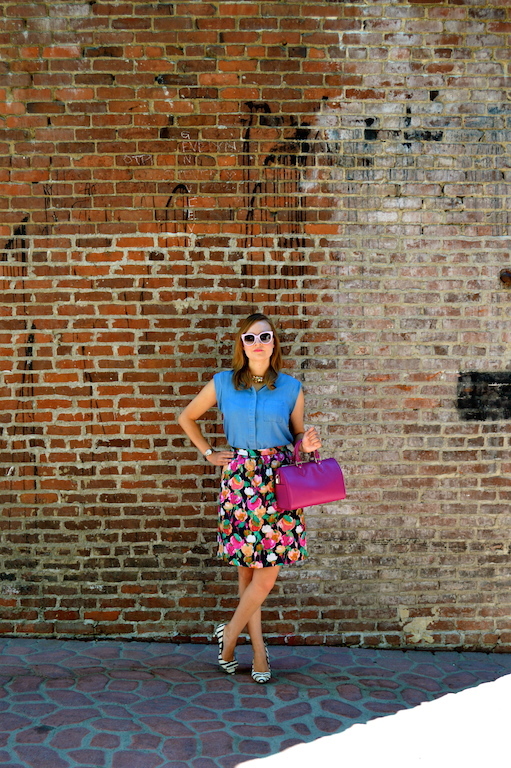 Stopping by from the StyleSessions link-up! I've never considered sunglasses to be seasonal - sometimes you need them just as much in the fall and winter months. 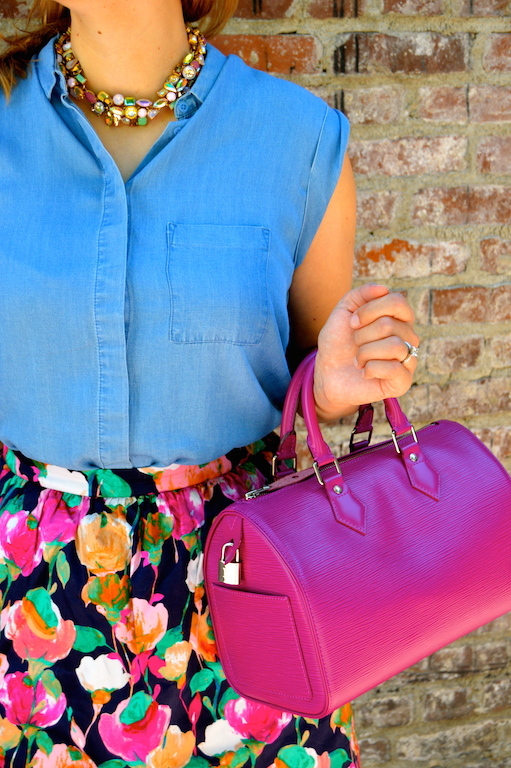 Love the chambray top, looks like such a versatile piece! I am in love with your glasses and selections of glasses pictured...and oh how I love your bright colors and pattern mixing here. Lovely! You have inspired me to try a similar combo with my floral outfit and striped pumps! 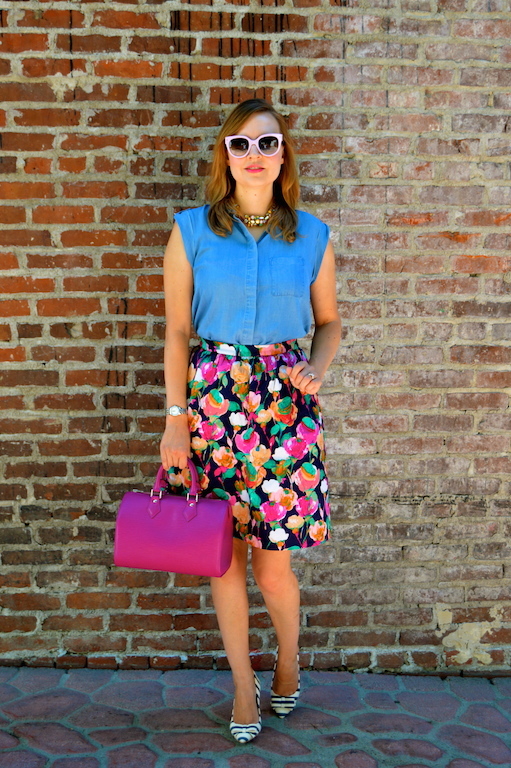 Great colourful outfit… I am a fan of sunglasses too. I have at least 16 pairs, some expensive ones and even ones from the dollar store.